Nylander Sitting for the Season? 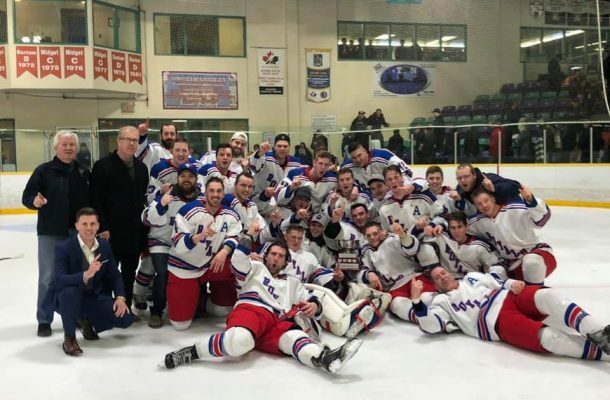 The Corner Brook Royals have won the West Coast Senior Hockey League’s championship, taking home the Cliff Gorman Memorial Cup in the 2018-19 season. Ian Pilgram led the Royals in their championship game, scoring 3 goals as the Corner Brook Royals bested the Port Aux Basques Mariners by a score of 6-2 at the Bruce II Sports Centre on Saturday, March 23, 2019. Teammate Dave Budgell chipped in 2 goals and Lucas Wiseman added a lone marker in the victory. Darren Dean and Trent Johanson scored for the Mariners in the loss. The game was saw several game misconducts handed out, including to Royals Ryan Hawco, Andrew Stagg, Kurt Etchegary, Tyler Hunt and Alex Hillier. The Mariners also saw Dylan Savory, Michael Lawrence, and Trent Johanson take an early trip to the dressing room. Scoring in the game was opened by the Mariners Johanson when he popped in a goal at 2:14 of the first, from Scott Francis and Steve Lomond. The Royals Wiseman evened it up at 14:12, with Scott Delaney and Pilgrim picking up the assists. Budgell then put the Royals up by one with a goal at 16:41. Stephen Gillard and Etchegary provided the helpers. Pilgrim scored his first of the night, from Delaney and Adam Guy, at 10:08, before adding another at 14:28, from Luke Pilgrim. Are you looking for the Newfoundland Hockey Talk discussion forum? Not a problem - simple click on this link to the Newfoundland Hockey Talk Forum. Newfoundland and Labrador Hockey Talk (NL Hockey Talk) is the leading online resource of hockey, hockey news and hockey stories in Newfoundland and Labrador. If it is hockey related and involves Newfoundland and Labrador, more than likely it will be on NL Hockey Talk. NL Hockey Talk is a community driven hockey site, dedicated to providing up-to-date information, news, stories and opinions on all hockey happenings in Newfoundland and Labrador. Find out how you can contribute. Have a Newfoundland and Labrador Hockey story, news release or some information to pass off to the readers of NL Hockey Talk? Why not take the time to drop us a note using our Contact form. For more information you can check out our Contribute page. Here at NL Hockey Talk we are more than happy to help you spread the word about your team, your hockey tournament or publish your hockey results.